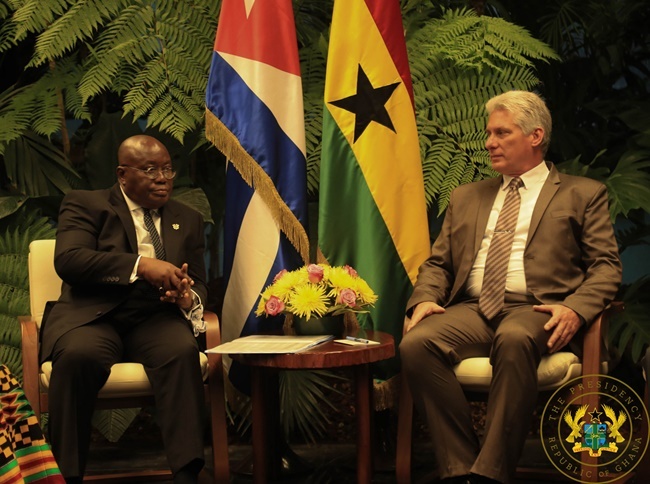 President Akufo-Addo says the prospects for scaling-up economic relations between Ghana and Cuba are considerable, and is calling for the two countries to continually search for ways to co-operate. According to President Akufo-Addo, “I have no doubt, that, together, we can forge a new, strong partnership for co-operation between our two nations for the mutual benefit of our two peoples”. The President made this known on Thursday, 4th April, 2019, when he held bilateral discussions with the President of Cuba, His Excellency Miguel Diaz-Canel, as part of his official visit to that country. At the diplomatic level, Ghana and Cuba have maintained relations since 1959. Indeed, Ghana was the first African country to establish diplomatic relations with the Government of the Cuban Revolution. Since then, officials of the two countries have exchanged high level visits. Ghana, President Akufo-Addo stated, is grateful to Cuba, through the Cuban Medical Brigade of some two hundred and twenty-seven (227) medical doctors, for the medically-related services they are providing the people of Ghana. “Six hundred (600) Ghanaian students have been given scholarships by the Cuban government since the year 2000, with some three thousand (3,000) Ghanaians benefitting from this arrangement in previous years. I am glad to note that, during this visit, new arrangements have been concluded to cover two hundred (200) more Ghanaian students to study medicine here,” he said. Paying tribute to the leader of the Cuban Revolution, the late Fidel Castro, President Akufo-Addo noted that it was during the time of the late Cuban leader that Cuba emerged as a reliable friend of Africa. As Ghana’s Minister for Foreign Affairs, the President stated that he had the honour of meeting Fidel Castro in April 2006, when he led Ghana’s delegation to the Ghana-Cuba Permanent Joint Commission for Co-operation, which was held in Havana. “In that meeting, he made a prediction about an aspect of my life, which has since come to pass. I lost track of time in the meeting with him, and soon realised that I was going to miss my flight,” he said. The President continued, “Then, in his still, calm but assured voice, Fidel Castro said to me, words I remember to this date, and I quote, ‘Don’t worry. Even if you miss your flight, there is another at a later time today. Don’t be in a hurry to leave because I might not have the opportunity to meet you again. One thing I can tell you is that you will be President of your country one day’”.